Palm trees add a tropical or exotic touch to any living space or landscape. Many types of palm trees are cultivated for container growth, making them a nice addition to a patio. In addition, some palm trees are grown indoors as houseplants. 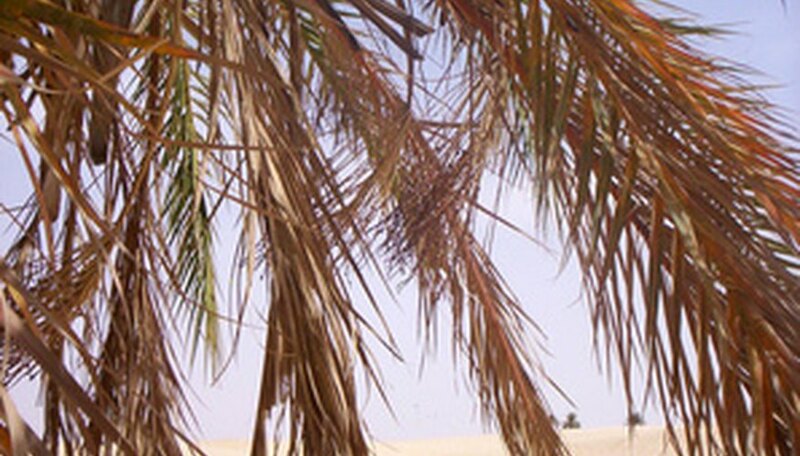 While palm trees generally are hardy and easy to care for, they sometimes develop problems, including browning leaves. Brown leaves on an indoor palm tree can signify a number of common care issues. According to University of Minnesota horticulturist Deborah L. Brown, palm trees are tropical plants and need a lot of light in order to thrive. Even indoor palm trees should be exposed to a full day of sunlight--at least eight hours; more than that is preferable. If the browning leaves are located on the lower part of the trunk, and the palm tree is located in a dark area of your home, it likely is not being exposed to enough sunlight. Over time, leaves turn brown and fall off, moving from the lowest leaves to the youngest leaves on the crown of the tree. Move the tree to a brighter location. Browning of the fronds, especially at the tips or along the edges of the leaves, can be an indication that the palm tree is not getting enough water. Palm trees need to be watered frequently during the growing season (spring and summer), and should be watered when the soil feels dry to the touch just below the surface. Slightly reduce the frequency of watering in the winter. Water slowly with warm water until the container is draining freely. Once the water has stopped draining, empty the water-catch tray so the pot is not sitting in water, as this can lead to root rot. With proper moisture, the leaves of the palm tree should stop turning brown. Palm trees grown in containers need supplemental nutrients. In some cases, however, this can be too much of a good thing. Home gardeners who over-fertilize their palm trees can cause salt and minerals to build up in the soil, resulting in the leaves turning brown along the margins and on the tips. In extreme cases, the leaves turn completely brown. Palm trees should be fertilized from late winter to early fall; after that, they should not be fertilized at all, allowing the tree to go dormant and rest. The best and easiest way to fertilize palm trees properly is to purchase palm spikes, which are formulated with the correct amount of nutrients and are made to release those nutrients for a set amount of time.